Why Would I Want a Wireless Alarm System Over a Wired Alarm System? There are many reasons why you would want a wireless alarm system over a wired alarm system. Wireless alarm control panels are much easier to install and program, making them ideal for DIY users. They also require fewer add-ons than wired systems, and they can be moved very easily. For a long time, hardwired systems represented the only option for alarm monitoring. But today, wireless systems are usually the preferred option. This is for good reason. Many end users have taken the DIY route for alarm systems. 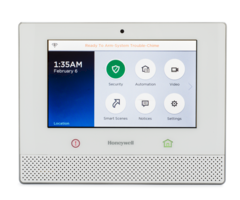 They have learned that they don't need to pay a professional hundreds or even thousands of dollars to install an alarm system when they can do it themselves. Wireless alarm systems are a big reason why this is possible. Wireless alarm control panels do not normally require any complex wire runs. In most cases, the most intensive part of the installation is mounting the system to the wall. Many users actually choose to skip this step by using a compatible desk mount and simply resting their system on a table or desk. This way, the only required tool is a screwdriver to open the back of the panel and connect the plug-in transformer wire. Most wireless panels can readily interface with wireless security sensors. These sensors are great for DIY users, since they will not have to run wires across the building. All communication will take place through a nice and clean wireless setup. Additionally, the sensors can be mounted using double-sided foam tape, which eliminates the need for drilling any holes into the wall. We have many customers who have installed complete and total security systems with nothing more than a screwdriver. No holes needed to be drilled! 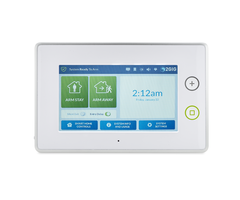 The typical wireless all-in-one security panel also features a convenient full color touchscreen controller. This differs from most hardwired panels, which usually rely on a separately added push-button keypad. End users often find that touchscreen menus are easier to understand, and they are superior for using on a daily basis. These built-in touchscreen controls also make it easier for a user to program their system during initial setup. Another benefit of wireless systems is that they require fewer add-ons. As we just mentioned, a wireless system usually has a built-in touchscreen controller. This is not the case for most hardwired panels, which usually require that a keypad is added separately. Many wireless systems also come with built-in communicators and wireless receiver modules. Some even come with integrated Z-Wave controllers. Wired systems usually need to have these modules added separately. Finally, a user might prefer a wireless system if they ever plan on relocating. A wireless system can easily be dismounted and taken to a new property if needed. This is much more difficult for hardwired systems, which are more or less integrated with the building. 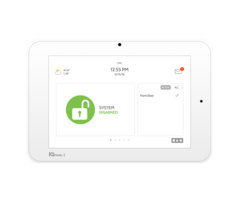 If you ever plan on taking your existing security system to a new location, choosing a wireless system might save you a large amount of hassle later on.